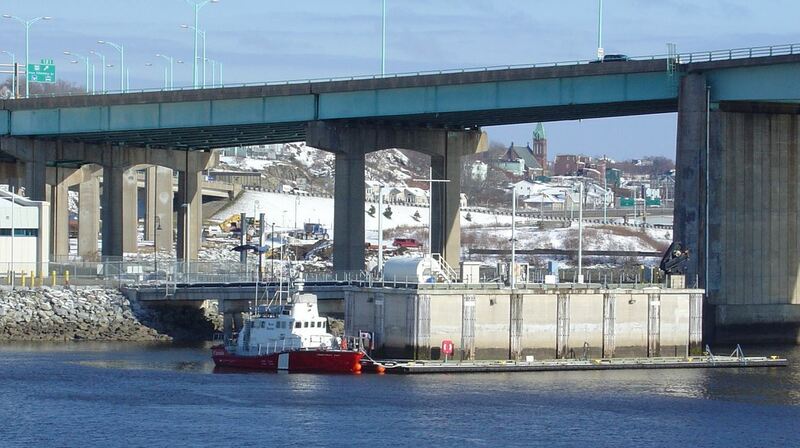 For Saint John Port Authority through Dillon Consulting. 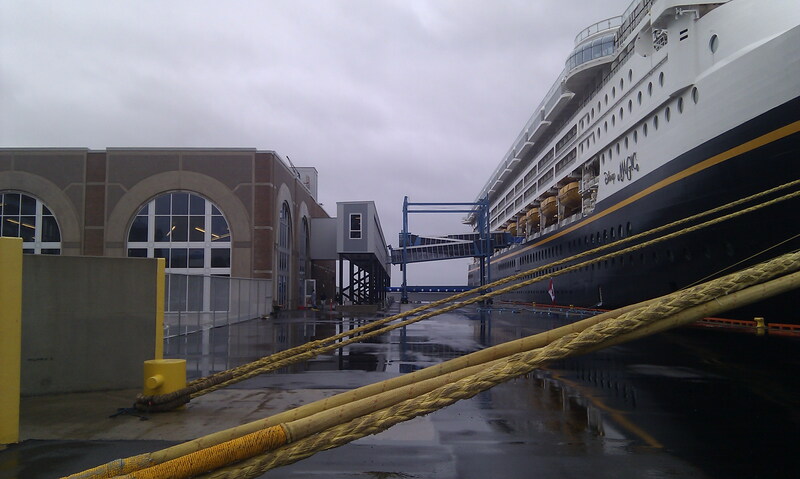 Mooring facilities to accommodate the largest cruise ships in the world at three different berths. Analysis and design of mooring dolphins to resist forces from currents and wind taking into account mooring line configuration and properties. Inspection of existing mooring dolphins. Stability analysis of existing concrete cribs. Foam filled fender design for corner impact forces. Numerous assessment and improvement projects were undertaken for the Newfoundland and Fundy services, where the latter was operated by Marine Atlantic. Transfer bridges were inspected, analysed and rated for Port aux Basques, Argentia, North Sydney, Saint John, Digby, Yarmouth and Bar Harbor. 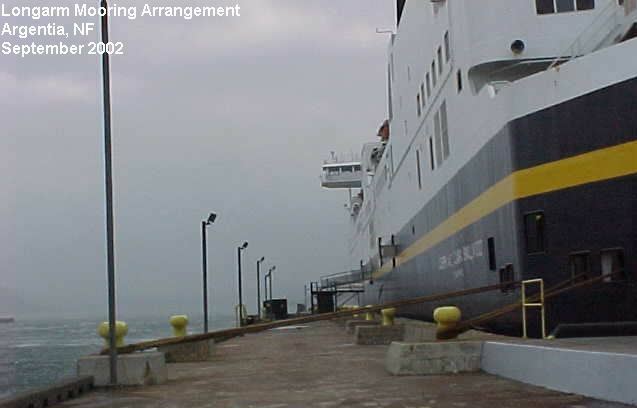 In some cases remedial designs were prepared for damaged components due to corrosion or accidental ship impact, or those that required change to accommodate different ramp configurations. The pile supported dock at Argentia had experienced substantial deterioration due to microbiologically induced corrosion (MIC). Analysis indicated that affected piles did not have to be replaced if the deck live load was reduced. 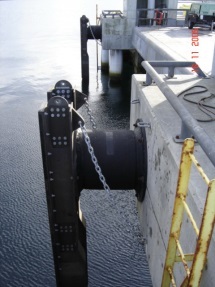 Design of corrosion protection system to stop MIC was prepared by a subcontractor. Design of replacement steel sheet pile current and wave protection wall in Saint John due to corrosion and fatigue damage. 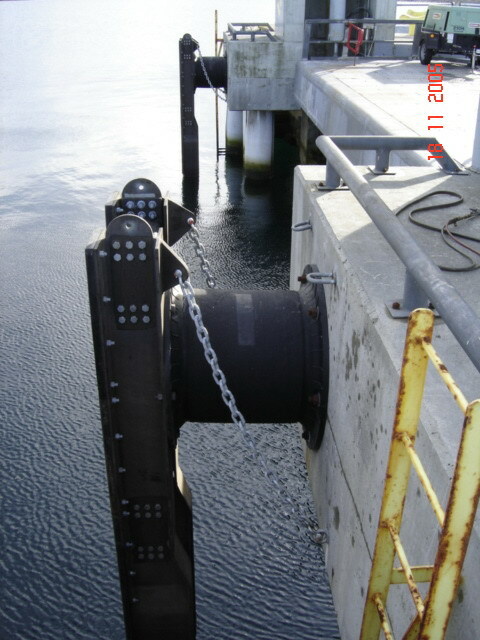 Design of fender system replacements in Argentia and Bar Harbor, including assessment of berthing forces. Clients include W. H. Crandall for Public Works Canada, Rothesay Paper, and Little Narrows Gypsum Co. Inspection and improvements to existing facilities and design of new facilities for Chatham, NB and a wharf extension in Newcastle, NB. Barge berth inspection, remedial design and construction supervision. Assessment and design of improvements for timber wharf supporting ship loader. In addition, both Stig Skarborn and Susan Guravich have marine structure experience with companies other than with Skarborn Engineering Ltd. Examples are the design of Point Tupper, NS, oil terminal berth #2, shipping terminal in Spragge, ON, field surveys for fishing harbour in Yemen, design of oil tanker and bulk handling terminal in Nanticoke, ON, and construction surveying for Saint John and Bayside, NB, terminals.